Standing on at least at least half of the tees and fairways of Prestwick St Nicholas a player cannot miss these iconic features, sitting between the 1st and 3rd greens. Occupying what today would be a prime residential site these grade A-listed buildings sit right at the seashore, built around 1760 for the salt boiling industry; before the advent of refrigeration, salt was vital for preserving food for the table and also for sailors travelling around the world. Known as the Maryburgh Salt Works, they were probably salt pans with housing above. Women would collect buckets of salt water and bring them into the Salt Pan House, emptying the water into large metal basins (salt pans) under which a fire would be kept stoked. The water would be boiled off and the resulting salt deposits scraped off and bagged for sale. The pair of houses are linked by a later wall which has been heightened and which was originally open at centre. The roof covering may originally have been pantiles or thatch, as shown by the deep skews with moulded skewputts along the roofline. The buildings were occupied well into the 20th Century with a recent visit by an elderly Canadian gentleman to the Club confirming for us that his uncle had grown up in the southerly one. Although what remains is incomplete, the surviving buildings have been described as "certainly the most complete upstanding remains of the (saltboiling) industry on the west coast of Scotland". In fact, they appear to be most complete to survive in Scotland. The Prestwick burgh/records of 12th February 1480 uses the term "salt pan hous" which suggests the existence of the industry locally by that time. The burgh records also discussed applications for erecting of salt pans on 25th June 1763 and 7th Sept. 1765 (information provided by Kyle & Carrick civic society). 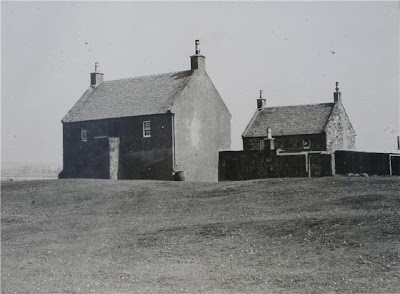 With the Club moving to its current site in 1892, it's clear that the Salt Pans are significantly older and are important historical Scottish buildings which can often be taken for granted. Why not come along and see them from the course, where the sea can be seen from every hole. See the new video of Prestwick St Nicholas on www.prestwickstnicholas.com.